It’s time once again to show off what you’ve been working on! I have such a good time looking through all of your projects and visiting new blogs each week. Great way to share projects! You have a very nice blogs about home decors. It's very useful for my blog as well. Great job! 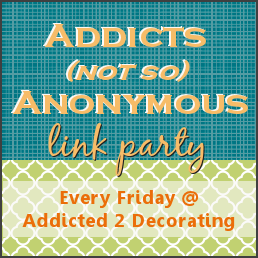 The link party is every Sunday. I'm considering changing the date, but if I do, I'll announce it here, as well as on the A2D Facebook Page, and I'll change the info at the top of the blog.